Rust is a fact of life. 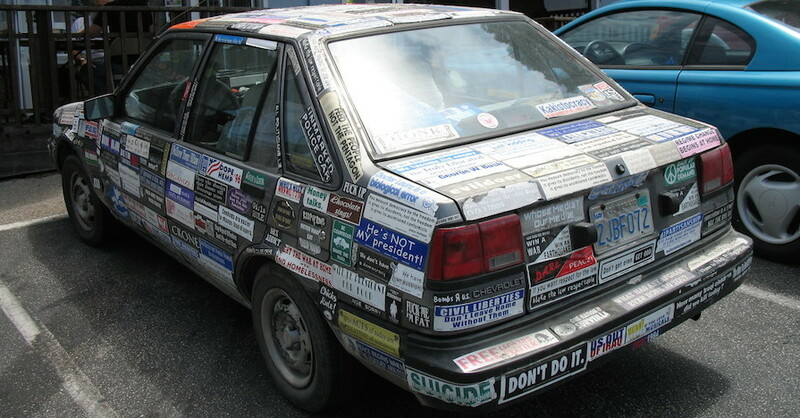 We all have to deal with its cancerous reign on our beloved automobiles. The trick is to get to it before it gets to you. 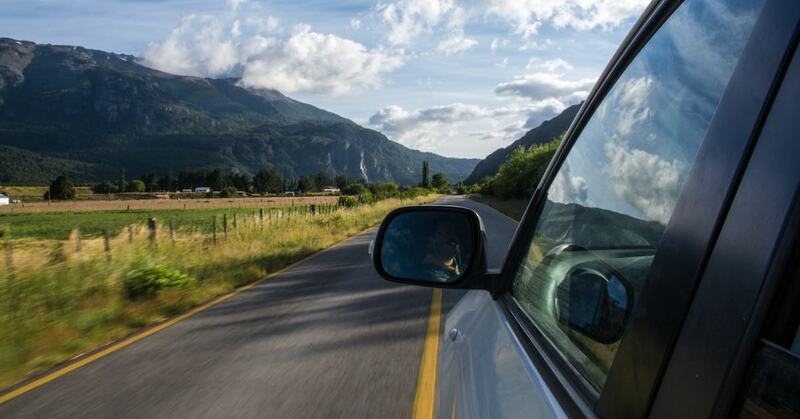 Rust can start at any time, anywhere on your vehicle, which means that you have to be proactive in abating the issue. 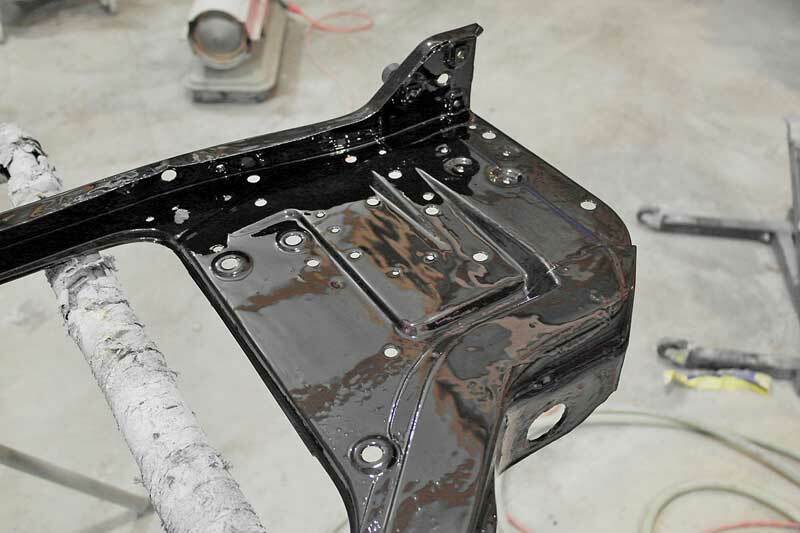 Treating rust on the exterior body panels often requires replacement and at a bare minimum body work and repaint, on the underside and interior, you can get away with simply treating the rust (provided it is not rusted through). The latest product from Martin Senour Paints is just the thing you have looking for: RustProof M/D. This core support for a 1967 Camaro is not in horrible shape, but it definitely needs some love. RustProof M/D will transform this into a nice part again. Rust is a chemical reaction between metal, air and water. 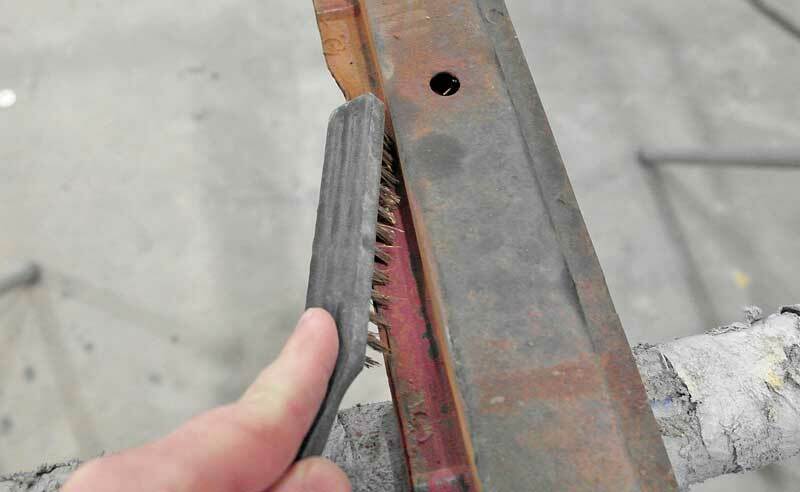 In fact, you only need two of these to get the process started, with all three in ample supply, your car’s sheet metal and steel are a veritable smorgasbord for corrosion. Rust usually starts small, but once it gets going, there is little that can stop it. You have to seal the metal from the air in order the stop the reaction. Aluminum can also corrode through a process called electrolysis, where the aluminum reacts to moisture in the air along chlorides (think salt water). 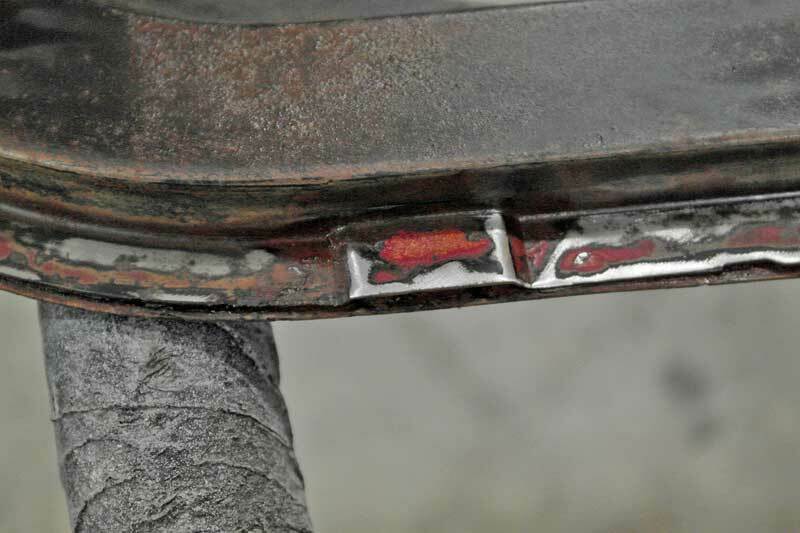 This leads to pitting and can eventually break the aluminum down completely just like rust does to iron. Old paint may need to be removed or feathered out. If it is chipping and flaking, it is best to remove it. 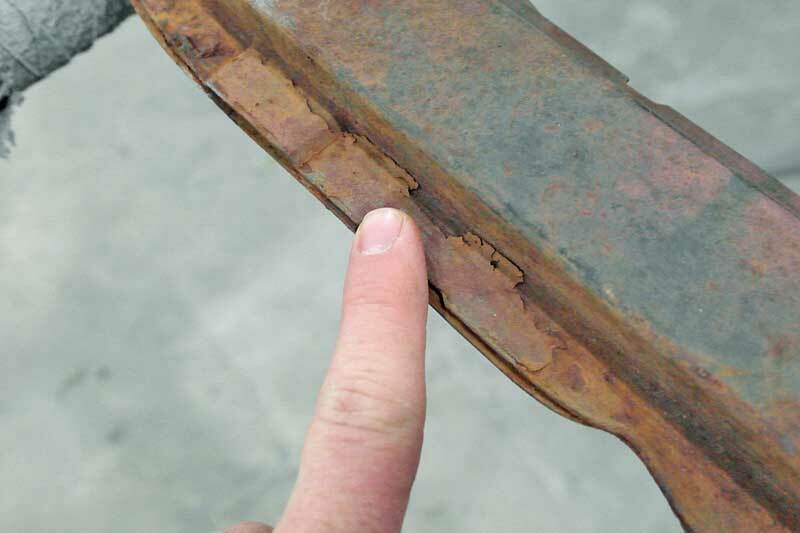 There are many ways to take car of rust, but most of them require complete disassembly of the vehicle, which is not always feasible or even justifiable. 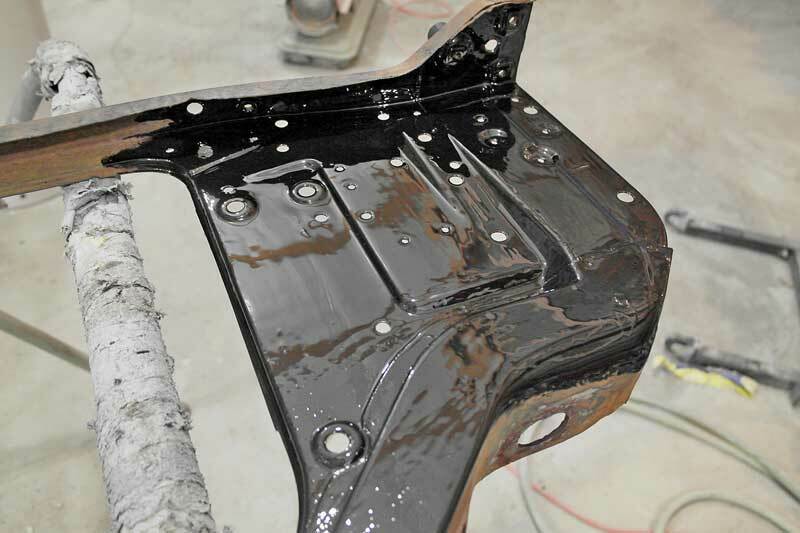 As the saying goes, “better living through chemistry”, Martin Senour Paints has created an alternative to complete rust removal, and instead turned to rust conversion and coating. 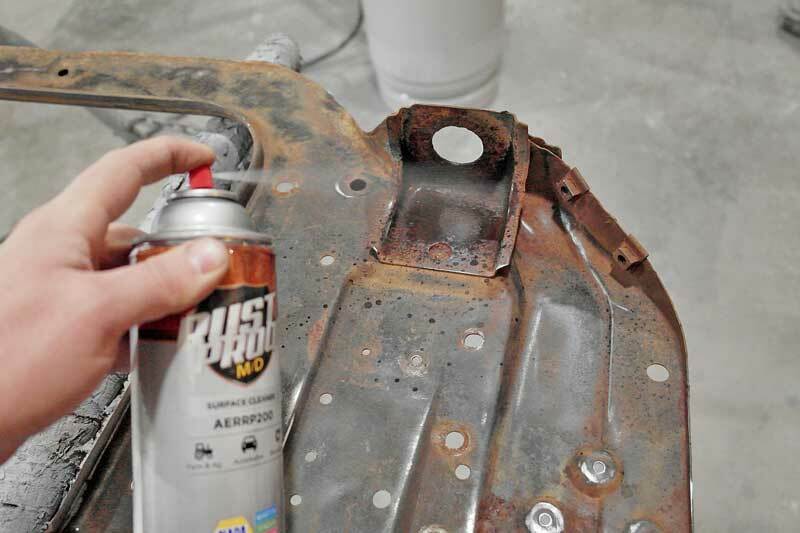 Unlike standard paints and coating, RustProof M/D treats rust directly, stopping it dead in its tracks, and sealing the metal away from oxygen & moisture to prevent any future corrosion. 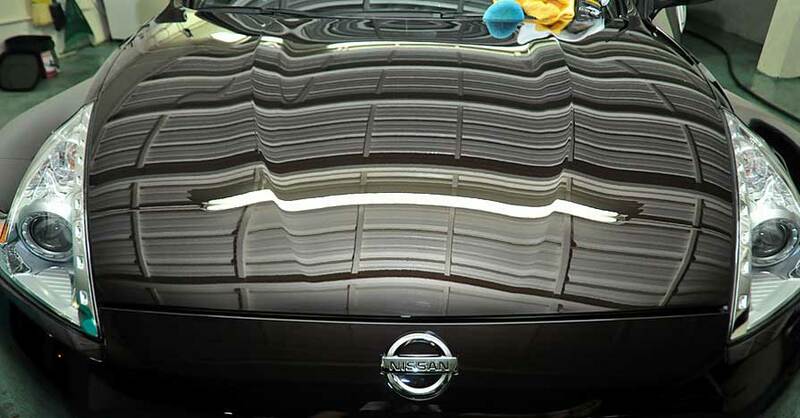 You might be thinking “why do I need this special coating, won’t just any old paint do?” That answer is no. Because rust is a chemical process, it has to be neutralized first. Just repainting over the rust won’t stop it, in fact, it can actually make it worse, as the rust will go deeper into the metal as opposed to spreading outward to the surrounding fresh metal. Additionally, the topcoat may not provide the right level of sealing, as even microscopic pores can lead to rust formation. Part of what makes RustProof M/D special is that it requires minimal preparation and can be applied of nearly anything. Factory paint? No problem. Prepped steel and aluminum? Sure thing. Rusty metal? You betcha. That is right, you don’t even have to remove the rust that currently exists on the surface, just knock down any loose flaky rust, clean & prep, then apply RustProof M/D and let it cure. All done. Unlike other rust coatings, RustProof M/D does not require a top coat, it has built in UV protection just like regular paint, so that it will not fade, deteriorate, or chalk up. 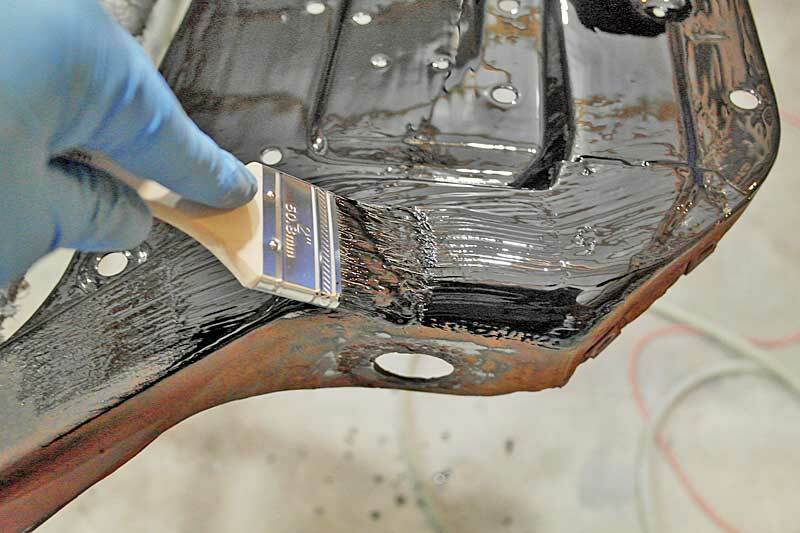 Applying RustProof M/D is straightforward, but you do need to pay attention, as there are a couple of tips that will make the process easier and yield better results. The first step is preparing the surface. Make sure you are working with a clean, dry surface. Remove any loose paint, rust, or debris with a wire brush, and then sand the surface with a gray Scotch-Brite™ pad or 320 grit sandpaper. If possible, blow off the surface with compressed air. We started the prep by scrubbing the entire piece with a wire brush to knock off any loose debris. 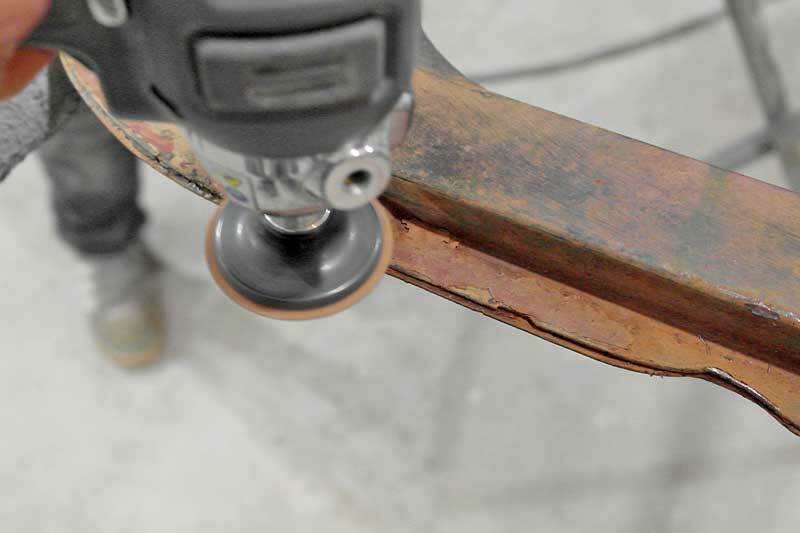 For the stubborn areas, and over old paint, we used a Scotch-Brite™ pad on a Roloc™ in a high-speed sander. You can do this by hand as well. The old paint gets removed or feathered out like this. Next, prep the surface with RustProof M/D Surface Cleaner (AERRP200). This specialized prep cleaner removes all wax, grease, and any other potentially harmful residues from the surface to be coated. DO NOT skip this step, it is critical for proper adhesion of the coating. If you have paint on your vehicle or project that is less than 6 months old, be careful with the Surface Cleaner, make sure that it does not get on the fresh paint, as it can damage the coating. Once sprayed with Surface Cleaner, wipe the substrate down with a clean dry cloth. 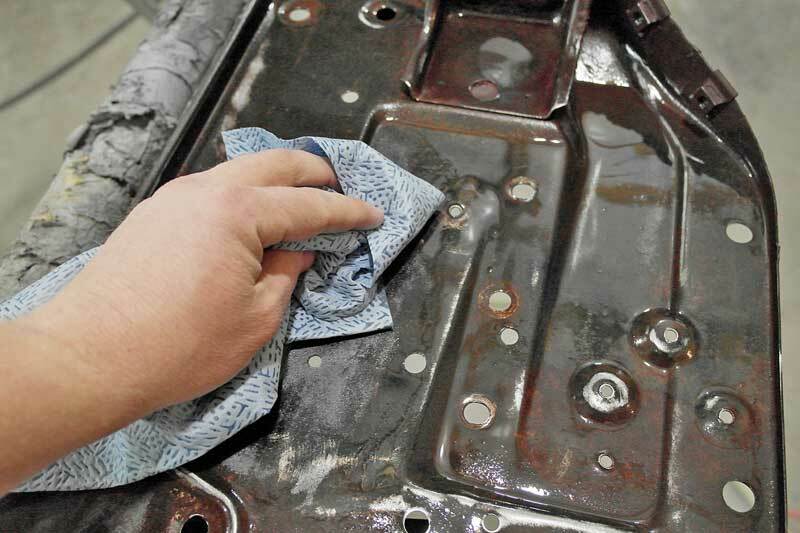 The entire surface must be prepped with the RustProof cleaner. This helps show you any paint that could lift, as well as preps the metal for adhesion. We used a towel to scrub the surface after spraying it down. You need to allow the cleaner to evaporate before coating the surface. RustProof M/D can be applied through spray, foam roller, or brush. Yes, you really can just dip a brush on the can apply it. In fact, that is the recommended application method. Once you open the can, use a stir stick to mix the contents thoroughly. 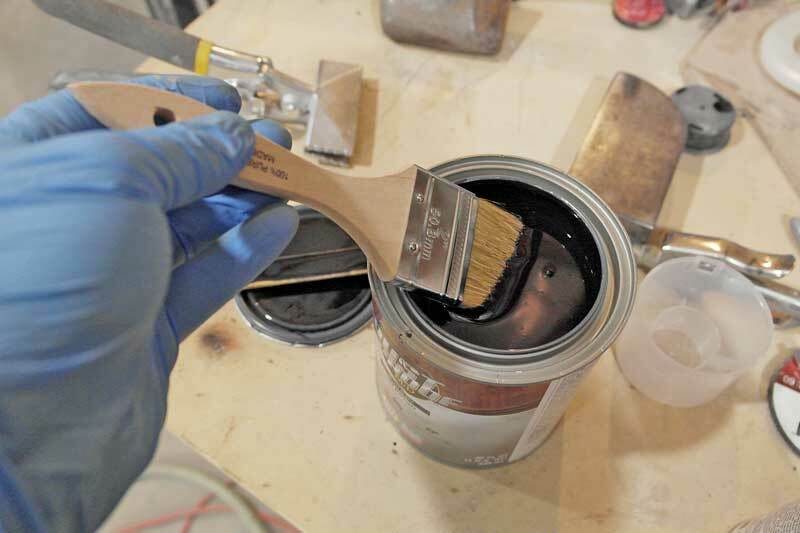 Caution- DO NOT shake the can, this will create bubbles in the paint that will show up in the finished surface, RustProof M/D is quite thick, and the paint will dry before the bubbles break, leaving rough surface finish. RustProof M/D is very thick, so you it only need a light stir before use. DO NOT put it in a paint shaker or whip the paint up with the stir stick, as this puts bubbles in the paint and it will show once it dries. We used a chip brush to apply the paint. Make sure the temperature is about 65 degrees, otherwise you could have adhesion issues. RustProof M/D is a moisture cure paint, meaning that is begins to cure as soon as the can is opened. 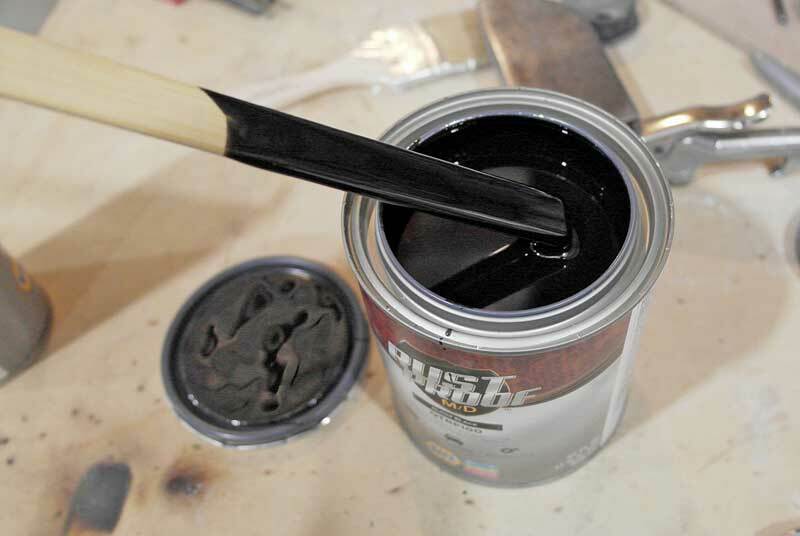 To avoid ruining the paint left in the can, pour out what you need and reseal the can immediately. Wipe the inner ring on the can so that it will open easily the next time you need it. The paint was applied gently, pressing it into the corners and crevices. Note the brush marks, you will see them when you lay the paint down. Using a brush or roller, apply a medium thick coating to the substrate, about 2 mils, until you have reached total coverage. The first layer should cover every area you are coating. Let this first coat dry for 2-5 hours (depending on thickness and temperature), then apply a second 2 mil coat and let cure for another 2-5 hours. If you need additional layers, allow each to dry for the 2-5 hour window. After just a few minutes, however, the brush strokes disappear, as RustProof M/D is self-leveling. Allow the paint to cure for 2-5 hours between the recommended two coats. Follow the same coating window guidelines. 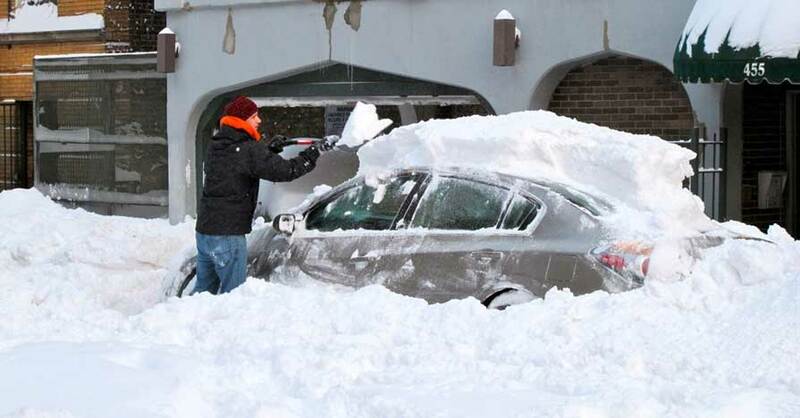 Once the coating is cured, you are ready to put the vehicle back in service. 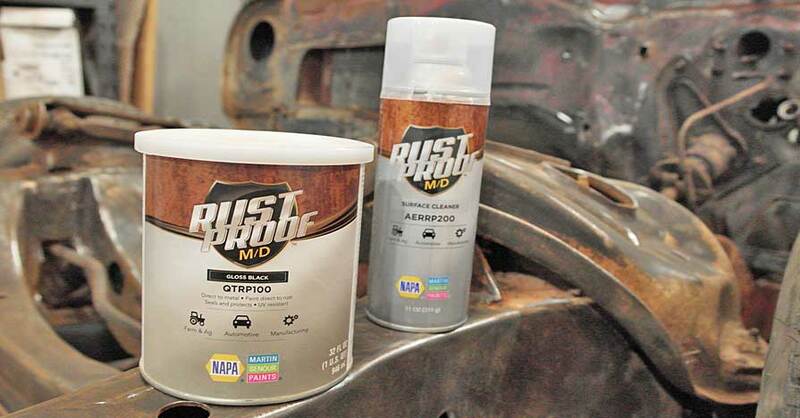 RustProof M/D does not have to be top coated, but if you want, it certainly can be coated with any automotive refinish. To prep RustProof M/D, sand the surface (only after a minimum 72 hours of cure) with 320 grit sandpaper until the entire surface is dull (no shiny spots at all! ), then spray it down with AERRP200 cleaner. Wipe the surface with a clean, dry towel, and you are ready to top coat. In the event that you need to recoat the are with more RustProof M/D, follow these same guidelines. The final finish is pretty dang nice. This is ready to go back on the car. This product does an excellent job of treating rusted metal, and leaves a nice gloss finish that is perfect for frames, floor pans, chassis components, any surface that needs protection from rust. 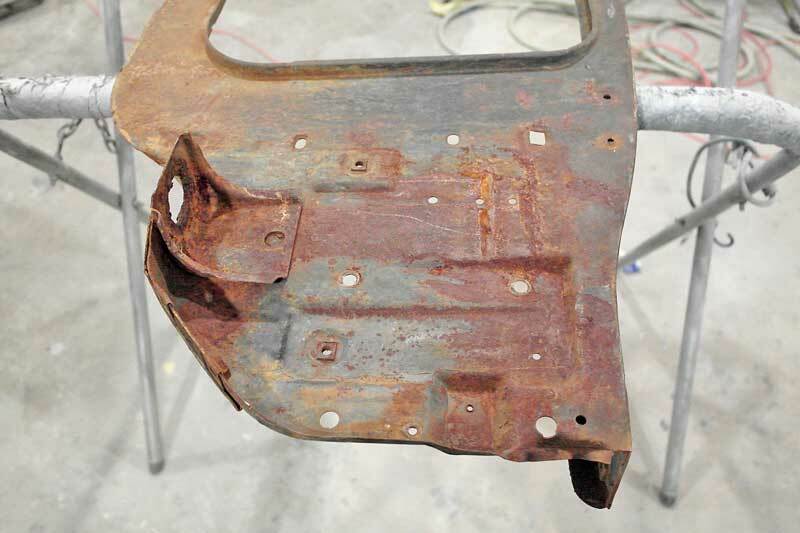 It also serves as an excellent base for treating rusty sheet metal that will be refinished with automotive paints to protect from future rust problems. Best of all, it is easy to apply without expensive and difficult to use spray equipment, so any DIYer can get the job done in their garage or even driveway. Check out all the paint & body products available on NAPA Online or trust one of our 17,000 NAPA AutoCare locations for routine maintenance and repairs. For more information on RustProof M/D, chat with a knowledgeable expert at your local NAPA AUTO PARTS store.